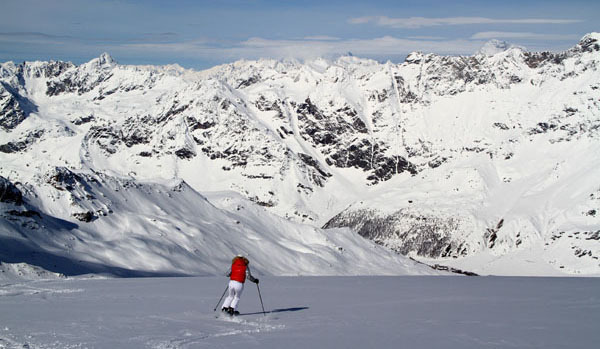 Skiing in Italy ranges from The Italian Alps and the Dolomites of northern Italy to volcanic skiing on Mt. Etna on Sicily. The Piemonte (Piedmont) Region in northwest Italy offers 53 ski resorts and 1300 km of runs, best known is Torino ( Turin ) for having hosted the 2006 Winter Olympics. We recommend skiing the Italian Dolomites, bordering Austria, which offer spectacular mountain scenery and several wonderful Italian skiing villages, Cortina and Val Gardena are two of the most well-known ski areas – ideal for a family ski vacation. Cortina d’Ampezzo is the largest ski resort in Italy, called “The Queen of the Dolomites,” made up of three separate ski resorts, Faloria, Tofano and Cinque Torri. Cortina is famous for hosting the 1956 Winter Olympics, and has been featured in films like Pink Panther, Cliffhanger, and James Bond’s “For Your Eyes Only” because of the spectacular beauty, classic Italian alpine village and sunny slopes. Cortina’s highest ski mountain is Tofana at over 9,000-feet. Cortina has top hotels and a sophisticated vibe – great for a week’s ski vacation. Val Gardena in the Dolomites is a beautiful ski village, with great ski slopes on both sides – best known for hosting frequent World Cup ski events. Part of the Sella Ronda circuit, Val Gardena has 80 lifts and a 8,261-foot summit, impressive ski lifts, and beautiful hotels in the village of Ortisei – plus a pretty pedestrian shopping zone for après ski. Cervinia (or Monte Cervino) in Italy borders the Swiss ski resort of Zermatt, and while not as charming as Zermatt, it is less expensive, with Italian food, and you can ski back and forth (cars are not allowed in Zermatt). Cervinia’s lift accessed summit on the Plateau Rosa is 11,417′, and the longest run is over 14 miles long, one of the longest in the world. Courmayeur is on the opposite side of Monte Bianco (Mont Blanc) of Chamonix in France. Courmayeur is a wonderful alpine village, some say the best ski resort in Italy. Courmayeur’s peak is 9,064-feet, shared with Chamonix. Finally, Mt. Etna is an Italian ski resort located on Sicily’s volcano. See our reviews on skiing the Italian Dolomites and our Ski Videos of the Italy’s Dolomiti Superski Region.